We all fear the loss of our identity and uniqueness. We seem to be acutely aware of this fear in a crowd of people. "Far from the madding crowd" is not only the title of a book – it is also an apt description of one of the most ancient recoil mechanisms. This wish to be distinct, "special" in the most primitive sense, is universal. It crosses cultural barriers and spans different periods in human history. We use hairdressing, clothing, behaviour, lifestyles and products of our creative mind to differentiate ourselves. The sensation of "being unique or special" is of paramount importance. It is behind many a social custom. People feel indispensable, one of a kind, in a loving relationship, for instance. One's uniqueness is reflected by one's spouse and this provides one with an "independent, external and objective" affirmation of one's specialness. This sounds very close to pathological narcissism, as we defined it in the Introduction to this essay. Indeed, the difference is in measure – not in substance. Healthy people "use" others to confirm their sense of distinctiveness – but they do not over-dose or over-do it. Feeling unique is to the average bloke of secondary importance. He derives the bulk of his sense of identity from his well-developed, differentiated Ego. The clear-cut boundaries of his Ego and his thorough acquaintance with a beloved figure – his self – are enough. Only people whose Ego is underdeveloped, immature, and relatively undifferentiated, need ever larger quantities of external Ego boundary setting, of affirmation through reflection. To such people, there is no distinction between significant and less meaningful others. Everyone carries the same weight and fulfils the same functions: reflection, affirmation, recognition, adulation, or attention. This is why, to them, everyone is interchangeable and dispensable. He "merges" with his spouse/mate and contains him/her as a representation of the outside world. He exerts absolute dominion over the spouse (again in her symbolic capacity as The World). These two mechanisms substitute for the healthier forms of relationship, where the two members of the couple maintain their distinctiveness, while, at the same time, creating a new "being of togetherness". To ensure a constant flow of Narcissistic Supply, the narcissist seeks to "replicate" his projected self. He becomes addicted to publicity, fame, and celebrity. Merely observing his "replicated self" – on billboards, TV screens, book covers, newspapers – sustains the narcissist's feelings of omnipotence and omnipresence, akin to the ones that he experienced in his early childhood. The "replicated self" provides the narcissist with an "existential substitute", proof that he exists – functions normally carried out by a healthy, well-developed Ego through its interactions with the outside world (the "reality principle"). In extreme cases of deprivation, when Narcissistic Supply is nowhere to be found, the narcissist decompensates and disintegrates, even up to having psychotic micro-episodes (common, for instance, in psychotherapy). The narcissist also forms or participates in hermetic or exclusive, cult-like, social circles, whose members share his delusions (Pathological Narcissistic Space). The function of these acolytes is to serve as a psychological entourage and to provide "objective" proof of the narcissist's self-importance and grandeur. When these devices fail, it leads to an all-pervasive feeling of annulment and detachment. An abandoning spouse or a business failure, for instance, are crises whose magnitude and meaning cannot be suppressed. This usually moves the narcissist to seek treatment. Therapy starts where self-delusion leaves off, but it takes a massive disintegration of the very fabric of the narcissist's life and personality organisation to bring about merely this limited concession of defeat. Even then the narcissist merely seeks to be "fixed" in order to continue his life as before. The boundaries (and the very existence) of the narcissist's Ego are defined by others. In times of crisis, the inner experience of the narcissist – even when he is surrounded by people – is that of rapid, uncontrollable dissolution. This feeling is life threatening. This existential conflict forces the narcissist to fervently seek or improvise solutions, optimal or suboptimal, at any cost. The narcissist proceeds to find a new spouse, to secure publicity, or to get involved with new "friends", who are willing to accommodate his desperate need for Narcissistic Supply (NS). This sense of overwhelming urgency causes the narcissist to suspend all judgement. In these circumstances, the narcissist is likely to misjudge the traits and abilities of a prospective spouse, the quality of his own work, or his status within his social milieu. He is liable to make indiscriminate use of all his defence mechanisms to justify and rationalise this hot pursuit. Many narcissists reject treatment even in the most dire circumstances. Feeling omnipotent, they seek the answers themselves and in themselves, and then venture to "fix" and "maintain" themselves. They gather information, philosophise, "creatively innovate", and contemplate. They do all this single-handedly and even when they are forced to seek other people's counsel, they are unlikely to admit it and are likely to devalue their helpers. 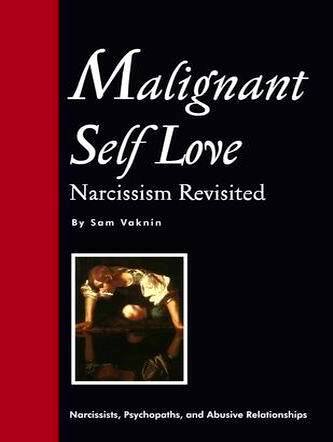 The narcissist dedicates a lot of his time and energy to establish his own specialness. He is concerned with the degree of his uniqueness and with various methods to substantiate, communicate and document it. The narcissist's frame of reference is nothing less than posterity and the entirety of the human race. His uniqueness must be immediately and universally recognised. It must (potentially, at least) be known by everyone at all times – or it loses its allure. It is an all or nothing situation.